Setting up an Electronic Bank Transfer is the most effective way to maximize your giving. 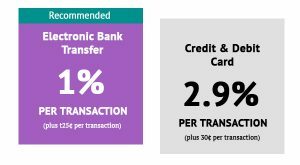 As you will see below, an Electronic Bank Transfer is the cheapest method to process gifts for Kilohana and maximizes the reach of your gift. As you can imagine, these fees add up when multiplied by greater amounts and over hundreds of gifts a month. Please consider adding the cost of the fees to your donation.